Tecnigas has more than twenty years' experience in the design and manufacture of exhaust pipes for mopeds and motorbikes. Tecnigas facilities are equipped with the most modern technology, both for the development of new products and for their production. Our priorities are, on the one hand, the quality and performance of our exhaust pipes, and on the other hand, respect for the environment. Tecnigas is one of the first Spanish manufacturers to obtain the new EC/24/97 homologations for devices of exhaust pipe for mopeds, compulsory since 18 June 1999. This way of working has enabled our group to become the foremost national manufacturer of exhaust pipes for scooters and mopeds and one of the European leaders in this field. 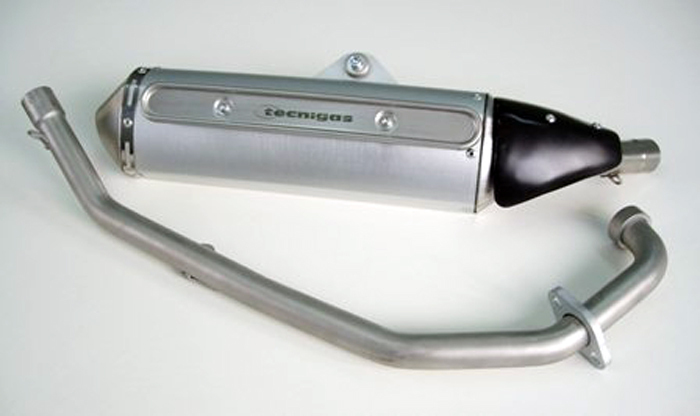 Staniforth Motorcycle Wholesale Ltd are the U.K's Sole Official importer and distributor of Tecnigas Exhausts. SILENT ROAD - NEW !! Specific lay-out of the expansion chamber and venturi system to provide optimum gas flow for maximal performances. Steel structure - Low noise level - Maximum performance as a silencer - Resistance and durability - Design very similar to the original - EC homologations available according to directive 97/24/EC. Optimum performance with minimum noise level. High class Tecnigas racing scooter line - Steel structure with the cone contracone principle - Silencer in anodised titanium alluminium of high quality - Low noise level - Maximum performance - Resistance and durability - Hand-crafted design - EC homologations available according to 97/24/EC directive. Perfect combination of high performance and low noise level. Expansion chamber made in 12/10 mm steel finished with titanium aluminium can. High performance features combined with an attractive price. It is every inch a Trek with the more durable and neatly done finish. Hydro formed exhaust pipe system, designed for competition use, especially in medium and high regime turns. Tecnigas moped scooter line - AP04 Steel structure with the cone contracone principle and completely handmade welding - Sound insulation through a resonating chamber system together with a bioxil compositum to reach maximum sound isolation. - Silencer in kevlar - High performance - Resistance and durability - Racing and hand-crafted design - EC homologations available according to directive 97/24/EC. Exclusive craftwork and design with optimal calculation of the expasion chamber & venturi systems for absolute performances. New Tecnigas off-road line - Stainless steel structure - Its structure perfectly fits the dimensions from the racing off-road vehicles - Silencer in black aluminium following the standards of the off-road vehicle design - Notable improvement in performance - Extra durability thanks to the resistance of the main material, stainless steel - EC homologations available according to 97/24/EC directive. The best choice for the most radical off-road mopeds fully handmade in stainless steel. Steel structure - Low noise level - Maximum performance as a silencer - Resistance and durability - Design very similar to the original - EC homologations available according to directive 97/24/EC. Optimum performance with minimum noise level for most of the Maxi Scooters.